Choosing a theme for a Sweet 16 is critical to the overall feel for the party. It can be a stressful experience. Do you go for something original and creativity or draw your theme from pop culture? Or do you try something more traditional? These are common questions that families encounter when planning a Sweet 16. To create a truly authentic Paris, France experience at your Sweet 16 it all comes down to the details. Everything from the music during dinner to lighting decor should create ambience and reinforce the Paris theme. From room décor to dress design, this event was all about the classic 1920s. Even the cake was Gatsby themed. Gold accents, an art deco motif, and centerpieces adorned with faux crystals and feathers completed the theme. Sarah and her family celebrated her Great Gatsby themed Sweet 16 at The Palace at Somerset Park. Many girls dream of being a professional model. Briel truly felt like one on the day of her Sweet 16. By incorporating Victoria's Secret brand elements we were able to easily make Marissa's vision a reality. Pink lighting, custom graphics, and name in lights with the Victoria's Secret font, all supported the theme. Mariss'as family even bought Victoria's Secret gift bags from stores around the state for guest party favors. Melanie's Masquerade Sweet 16 at Hilton Pearl River was a night to remember. She wanted a modern sweet 16 with a hint of a traditional quinceañera due to her family's cultural background. Ornate masks were provided for all her guests. The masks were arranged on each table for guests to enjoy. Hurricane Productions provided custom masquerade theme graphics and Snapchat geofilter. Brianna brought all the bright lights and energy of the city to her party. Custom graphics, including Brianna's name displayed on billboards in Times Square's, along with a skyline 'name in lights' created the big city atmosphere Brianna was hoping for. 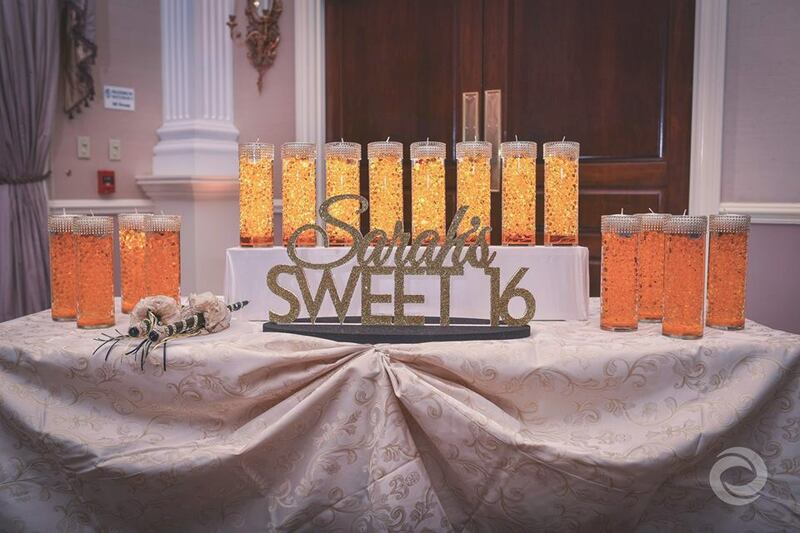 Sofia celebrated her Beach themed Sweet 16 at Knob Hill Country Club in Manalapan. Hurricane Productions provided blue and green accent lighting as well as beach themed graphics to display on screens throughout the ballroom. Custom tropical themed motion graphics were displayed on large screens alongside streaming social media from Instagram via an event specific hashtag. Just because it's cold outside doesn't mean you can't have a hot party inside! Kayla's party was decked out in a full-out winter theme complete with a special FX snow machine to compliment her snowflake name-in-lights design. Alexa's family spared no expense for their daughter's Sweet 16. They rented numerous spooky animatronics and decked the venue out in full Halloween regalia. Everyone at the party was screaming; not out of fear, but because of the energy on the dance floor. The theme was established with a long regarded symbol of good luck and fortune: The Elephant. Samantha's Sweet 16 celebrated wearing a traditional saree paired with henna body art. The room decor featured bold colors including a deep red, cyan, purple, and gold. Ashlee had so much going on at her party, it brings unforgettable to a new level. From contortionists and jugglers, to a grand entrance popping out of an inflatable ball, Ashlee's Circus themed party was extravagant to say the least. Sabrina celebrated her Disney themed Sweet 16, with family and close friends at Ria Mar in South River. A Cinderella Castle name in lights projection was prominently featured in the venue's lobby while custom graphics made use of Disney's authentic fonts and color scheme. Need help with your Sweet 16? Hurricane specializes in creating one of a kind experiences for Sweet 16s and other events. Offering a wide array of Sweet 16 services, Hurricane is a one-stop-shop for everything Sweet 16. Services include DJ Entertainment, Photo Booths, Lighting, Photography and more!